Have you ever wondered if the choice between a browband headstall or a one ear headstall was made for fashion or function? I remember wondering if there was really any difference or if it was all about looks. It turns out it is a little bit of both. Fashion preference aside, the biggest reason to choose between a browband headstall or a one ear headstall is the bit you will be using with it. Will you be using a leverage bit or a snaffle bit? Each has a different effect on the headstall. A leverage bit, sometimes with a shank, will put a slight downward pressure on the crown of the headstall when the reins are engaged. This slight downward pressure reduces the chances of the headstall slipping off over the ears. This combined with the open throat latch area is why you will often see single ear headstalls in the show pen being used with leverage bits. A snaffle bit has the opposite effect when both reins are engaged. 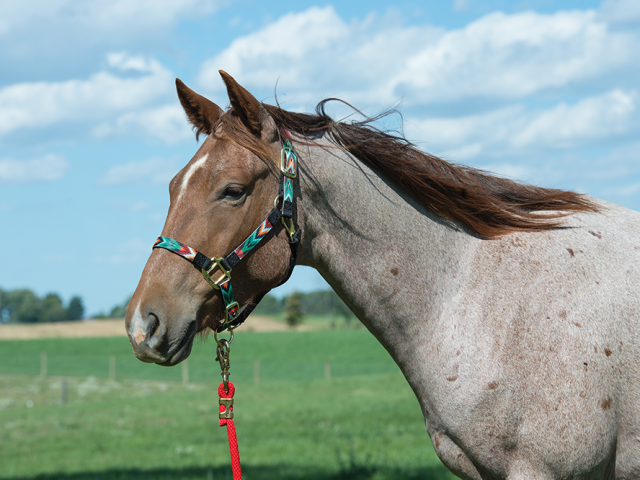 The headstall will slightly loosen which is usually most evident in the cheek pieces on the bridle. This is why riding with a throat latch is recommended when using a snaffle. When I look around my barn all of my snaffles are on browband headstalls and many of my show bridles are the one ear variety. Training bits are on a mix of headstall types. 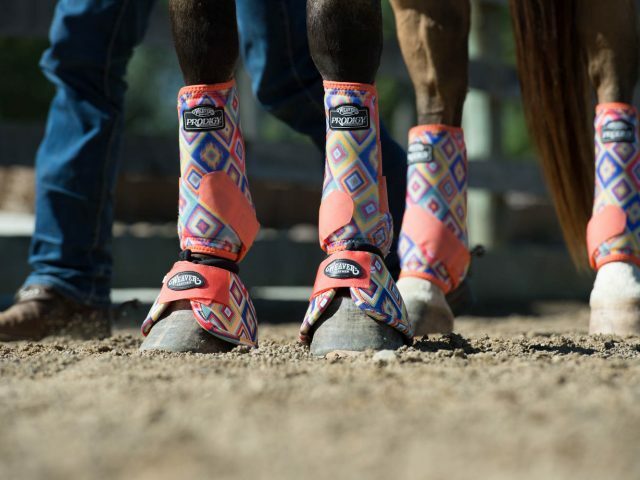 What headstall are you using and why? 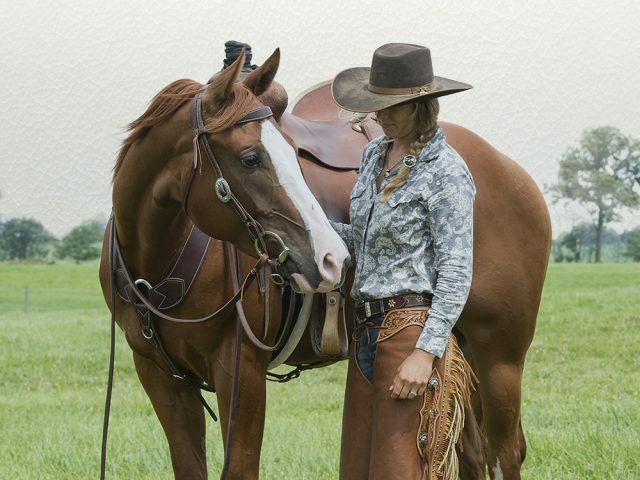 LEAVE US A COMMENT FOR A CHANCE TO WIN your very own Stacy Westfall Cowgirl Spirit headstall. Entries open until Friday, August 10th. Winner randomly selected and announced in comments. STAY TUNED!! Everything I use has a throatlatch. My current favorite is my one ear headstall w/ a throatlatch. Best of both world with that one! I loved this article! Definitely did not know this. I’m glad I was already using a browband with my snaffle! I prefer the headband over the one ear headstall because of all the trail riding I do. If I use my one ear, it has the throatlatch on it also, so that works too. Love this… not many people understand the purpose and role a headstall plays. What you said makes perfect sense. I tend to use a snaffle usually so I do like the browband headstalls. Guess I knew what I was doing all along! Wow! That is nice to know. I actually have both types of bridles but did not know there was a difference based on the type of bit being used. Thank you for that educational piece. ‘One ear’ with a shank bit to keep my bridle in place during rein maneuvers. I usually use a browband anyway, so I guess I am good! I personally use snaffle bits typically so I use a browband. Great info! I will use both, but only paired with the appropriate bit, as explained in the video. Actually that encourages me to transition my horses in the curb bit earlier, as I love them 1 or 2 ear headstalls ! I use a brow band headstall mainly because of the bit I use like you had said and also I’ve found trouble when using a one ear headstall, my horse likes to rub her tack off when she’s bored and when I try a one ear head stall she finds it easier to take off than a brow band one. I typically ride in a browband headstall because I do a lot of trail riding and appreciate the added security of the throat latch. My mare shook off my one ear headstall a few times while riding, thankfully she was a well trained girl and there were no issues there. This is so interesting! I’m glad I know this now. I ride in a one ear headstall, but I also enjoy browband headstalls. It’s nice to know the difference between the two! Great info. I have all my bits on browband headstalls but I had no idea about the leverage on the bit. I always use a browband. I always use brow bands, they have extra support with a chinstrap to insure it will stay on and support. I don’t mind a one ear for showing young horses with a snaffle, but it could get caught on something and come right off , happened to a friend of mine when we were trail riding, let’s just note the horse luckily knows how to to ride with a neck rope! I use both brow band, and one eared, and oddly enough, a two ear. It depends entirely on the situation: If I am working, training, or trail riding, I use a browband to help prevent the bridle from escaping. If I am in a controlled show setting, I have both a single ear and double ear headstall that I use, depending on the horse & bit. I always use a headstall with a throat latch if I have a snaffle on (lesson learned from losing a bridle while riding as a kid)! One of my geldings shakes his head with a browband, but he doesn’t with a one ear. I use both, depending on the bit uses and particular horse’s comfort. I ride with a browband headstall because it is what I have experience with. I do like the security of the browband though, versus the one eared, that is a given. I ride primarily in snaffle bits right now, but I am glad to now have this knowledge for the future! I use a little bit of everything. I have brow bands pairs with shanked bits. I have both one ear and brow bands on snaffles. And I have lifter (or I have also heard them be called elevator) bits on both single and brow bands. To be completely honest all of my bits and head stalls are all my moms that I “barrow” from time to time. The only one that I own was a birthday gift to myself, it’s a one ear head stall with a snaffle bit. I use one ear. I will be looking for a brow band though. I found the article very informative. Thank you. Love all the great info you give! I always look forward to your posts, and I tell my summer horse campers about them! I’ve always used a browband headstall with my snaffle bit. To be honest I didn’t know this tid bit of information about the difference. It’s fascinating! I have always used a browband with a throatlatch. Mostly because I have only had a snaffle on my horse. I always liked the look of a one ear though. I use both types of bits, but never thought about what but I was using with them. This is great information and now I will be checking all my equipment. Thanks for the new knowledge. I’ve always wondered the difference between the two! Thanks for sharing! I do like the looks of the single ear headstall, but I do like the function of the browband headstall. I ride my horse with a snaffle. I ranch and use the browband headstalls the vast majority of the time. Awesome, I didn’t know this! Great article, I never would have really thought about why use one over the other. I’ve always thought it was personal preference but the engaging of the bit with the brow band headstall makes perfect sense. I always ride in a one ear but now I definitely think a brow band is more suitable for me. I do a lot of trail riding and contesting so I need my headstall to stay put. Thank you for the great knowledge! I always appreciate learning from you. I use a Browband now, although I like the looks of a One Ear, my current horse can get it off… I use a snaffle also. Great information! Thank you! I use a browband headstall when I ride. I almost always use snaffles on my horses so browband bridles are my go to! 🙂 I would love to win one for my young colt! I mostly ride and train young horses theses days, so I use a browband head stall with a snaffle. On my upper level horse I still like to use a browband as I like the look better. However, there are some horses with small and petite heads who look better in a one ear and I will use a one ear with those horses. I just bought my first one ear headstall with turquoise accents. I love the detail and simplicity of the one ear. I ride in a brow band. I do have a one ear, but I am not using it at this time. I use both types of headstalls since I ride sometimes in a snaffle and sometimes in a shank bit. This was the first time I had heard this explanation of the different reasons for using both. Thanks for posting. I use a brow band headstall for safety when trail riding. Just in case you catch a branch on the cheek piece. Thanks for the video, I did not know the difference. Thank you never heard of anyone explaining the difference or that there was a difference other than preference. While I prefer the aesthetics of the one ear bridle, I am trying to do more work with just a snaffle, so the brow band is the smarter choice for me. I use a brow band because I ride a young horse. However, I think the one ear head stalls look nice in the show ring. I have been out riding and had my horse shake her head and have the one eared headstall come off. I have a couple one eared headstalls, after that, I will never use a one eared headstall again. Thankfully my horse is well broke, but should you be riding a colt, green horse or rank horse, there could be a serious wreck. For me it’s safety. I use a browband as when riding in the hills it is less likely to get rubbed off. Excellent video. I love all the information Stacey shares. I always use a brow band. Great article. I’ve been using a browband. Nice to know the reason behind both – makes sense! I always wondered what the difference was! I use a browband because my horse prefers it, but I ride in a snaffle too. I’m so glad I’m doing the right thing! The band also keeps my horse’s long forlock out of the way! You always fascinate me with how you teach things. You have opened up my eyes to so many things that I never knew, even though I thought I did. I have learned so much from you. My horse and I have daily conversations now. 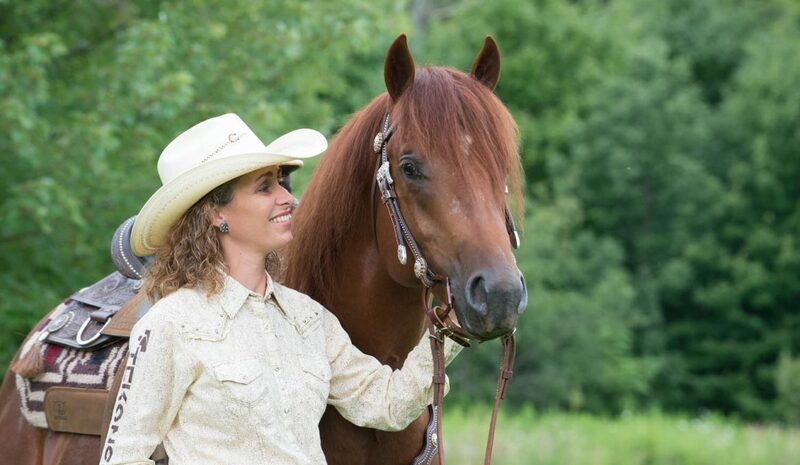 Through your videos, blogs and emails the relationship my mare and I have and also the huge strides we have made in performace together has been immeasurable. Your video and explaination of the differences and functions of the two headstalls is great!! Thank you for impacting my life and making my daily experiences with my horse better. I have a Haflinger/paint cross. One-eared don’t always fit as well so I have been wanting to try a brow band. I do use a small shanked 3-piece bit. I prefer the one ear if possible, but I use the browband anytime I’m not using leverage. I love the clean cut look of the one ear though. I have always used browband headstalls. Like the video states, they are more of a safety issue where they cannot come off. I own both types of headstalls and bits, but prefer using a leveraged bit with the one or two ear headstall for its simplicity. Thanks for making me THINK about the pros and cons of each. Great information! I learn something new every day and love all the knowledge that you share with everyone to help them improve and learn to be safe around the animals that they love. Thanks for what you do! I use brow bands just because I feel more secure with a throat latch buckled on the horse. Always learn something new with Stacy 🙂 I had never really thought about the different styles related to the type of bit. Looking forward to passing the info to my students. I prefer the browband style overall. Interesting how each style functions. My mare is only a yearling so I am not using a bridle right now however my grandmother has her horse in a twisted snaffle with a one ear bridle(ill be showing her the video tonight) because shes had the same bridle for 4 generations of a horse she owned. The bridle is used for everything. I will go out there to say she is stuck in her ways….. Learn something new everyday, I certainly did not know this and I will apply it to my yearling when she goes to training. I’ve often used a one eared bridle because that is what I was had. My experience of browbands were on English bridles. I had no idea what the browband did, but with Stacy’s explanation of the difference in the action on the bit–it seems that both are necessary to have on hand. Thank you, I have wondered. Might just go out and get a one ear…. I love one ear headstalls will a snaffle bit. They are more secure and stay in place better. The best for me and my four year old would be the browband! I am so happy I know now that the headstall actually has a effect that’s not just to hold the bit in their mouth. Thanks for teaching me! I usually ride English style or on an endurance style work saddle on my gaited horses, so I usually use a browband bridle on all of my bits for showing. We do use the Paso version of a single ear headstall (but without the ear loop) on our curb bits. Definitely would not want to lose a single ear bridle while riding through the woods though. Thanks for the informative video. Thank you so much for this post! I have one of each of these bridles, but never had any idea the functionality behind the two different styles. Awesome info! I started riding western about a year ago, currently on the path of Western Dressage, I’ve always leaned towards the browband with throatlatch, and I always use a snaffle bit, I have always wondered if there was a technical reason to use one of the other … really great to know I’m getting this right, thanks! I use a one ear headstall but I didn’t know there was a reason for using it versus a brow band. Thanks for the info! I have always preferred a Brow Band…..thanks for the information! I like the look of a browband and I have to confess…I really like the one you have in the video! Wow this is great information, Learn something new every day. Obviously with my mare being a yearling a brow-band is going to be best when she starts her training process because she will be in a snaffle. however my grandmother has a one eared bridle with a twisted snaffle, (i’ll be showing her this video) Shes had it through 4 generations of a mare named dream to goldie to nikki to Rockie and I am 95% sure its a weaver! After she watches this video we’ll see if she changes her ways. Good video, explained well. Thanks! I never knew that the use of different types of bits should determine which type of headstall to use! I just always thought that using a browband headstall with a throatlatch was more secure. I just happen to use a browband headstall with a snaffle, so I’m doing the right thing and didn’t even know it! Thank you for enlightening me!! I always thought it was just because of my horse’s head that the one ear came off–usually in a show. What you said about the differences makes perfect sense. I have always used the browband style and often ride with a snaffle bit so now I know why it works for me. I use a bowlbown. Thank you for the info! Interesting info I did not know about the one ear headstall. Great information! I prefer browbands simply because they have throatlatches and therefore seem more stable. It’s not fun when they rub that bridle off! Interesting to know! I ride in a one ear headstall, but I also enjoy browband headstalls. It’s nice to know more about the others understanding of the differences between the two! I love my Westfall Browband headstall! I have to keep changing the side buckles for my two different horses. I would love a second headstall. They are the best! I prefer the safety of a browband/throatlatch style since I trail ride. It is much too easy for a one eared style to become dislodged out on the trail. I do like the looks of the one eared on show horses. Less of a distraction to enjoy pretty faces. Each has its place. That was a great explanation. I use a brow band, my mare’s “crown” with a snaffle bit for trail riding. I’ve always wondered why a one ear versus a browband. Now I know! Would love a chance to whine the browband headstall! Interesting article. I thought it was a personal preference. Good to know. It always amazes me that there is stuff I just don’t know about. Thanks for the info, this will help me make a better choice. I prefer the browband. Nice video! I use a browband with snaffle bits; a one-ear for shanked bits. However, I prefer the browband as I feel it stabilizes the bit a little better in the horse’s mouth. I was always told a brow band with a snaffle! I would love to win one! I’ve always liked the look of the browband. I usually do most of my riding in a snaffle, but I’m usually riding other people’s horses, so I ride in whatever they provide. I never knew the purpose of either. Always thought it was just preference. I own the Pro-Tack Oiled Browband headstall & it is the best working tool on the market. I may sound like a Weaver representative, but the headstall is practical, made with quality leather & it doesn’t break the bank. Thank for the great information!! Learn something new everyday! I have always used one ear headstalls. I feel like they fit my horses head better. I also thought that browband headstalls were for horses 5 & under. You learn something new everyday! I put a knitted crochet fly veil on my horse and she would shake her head and it would eventually loosen and come off so one time I put it under her browband headstall. We were on the road and she shook her head so hard the whole browband and fly veil came over her ears. I just caught it before it slid down her face….oops! I prefer to use a brow band headstall with a snaffle, although I do own a few one ear headstalls also. Well, so that’s the difference between the headstalls. I always thought they were for show. P.S My horse would look great in this. I use browband . I trail ride and have had a horse rub his head on his leg and knock off a one ear head stall. My preference has always been a brow band headstall. I believe they are more balanced and secure. I typically ride in a broken snaffle so that is one reason for choosing a brow band over single ear. Also, with young horses that tend to rub, a one ear headstall comes off too easily. Lastly, I find them more aesthetically pleasing. Thank you for sharing your thoughts on this topic Stacy. Browband and snaffle for trail riding because my horse responds best to it! I love browbands for training, but I use a split ear for show! I use a browband with throatlatch because I find it is safer/has less chance of coming off especially when trail riding. I do love the look of the one ear headstall as well and I have to say I love the one you ride in Stacey. Many years ago when trying to get my horse used to a knitted/crochet fly veil I eventually tried it under the browband headstall as she was always shaking her head and it would loosen and eventually she’d pop an ear out. The one day I decided to put it under her browband headstall which I find is a snug fit and one of the reasons I would like to try a one ear piece on her, she shook her head so hard while we were out riding that the browband and the fly veil came over both ears and I just caught it before it slid down her face….oops!!! I have both and never knew about this difference. Thanks Stacy! I never knew this and loved the article and video. I always learn something from your emails or articles. I have only used a brow band with a snaffle bit, and was just lucky it worked out that way. Never knowing the difference could have gotten me in trouble!! I like a brow band for snaffles (& the youngsters they’re on) & a one ear for a ‘finished’ horse. I use a browband because that’s what I grew up using (Quarter horses) I just like the security of the throat latch. I ride with snaffles or leverage curb depending on which horse I’m taking out today. Thank you for the info! I had always thought it was just a “looks thing”. One-ear is my preference. Simple and clean lines. Easy on/off for working multiple horses. As a beginner I thought to start with a browband. I never knew there was a difference in usage! Looks like I’ll be out fixing my headstalls this weekend! Very good video. My choice was made on how it looked on my horse. If he had a longer head then I chose the brow band, if a smaller head I used the one eared/with throat latch. Love the demonstration, I’ve always liked a browband headstall for snaffles and a one ear for leverage bits. This explained it very clearly. I do currently have a one ear with a snaffle on my mare right now though just because my two ear headstall is looking a little rough! 😬 Thanks for the great information! I rode without either one for a very long time. I used a halter and reins or the Monty Roberts training halter as a side pull. THEN I fell in love, left Oregon and came to California where my Sweetheart introduced me to a one eared bridle. He has others but this is definitely his go to and it works great. I am such a HUGE fan of yours and want to thank you for all you have done to teach so many of us so much. God Bless and Thank you again! Thanks, Stacy! The reason for one versus the other kind of headstall makes perfect sense. I’d just never thought of it before 🙂 Learned something new! I love the look of the one ear, but use a brow band and snaffle bit! Love Stacy and her helpful advice! I grew up with traditional brow and headstalls with curb bits. Same thing on every horse. I use a snagged on my Thoroughbred, and a Tom Thumb on my Paso Fino. I have black tack (searched a long time before I found my headstalls to match. They are plain with a browband. Thank you for all your information, I really look forward to what is next! Keep it hoof side down! The reason makes sense – I just always preferred a browband. It seemed more even pressure – now I know there’s a good reason. I’ve been enjoying your videos very much and this one was also so helpful! I use a browband and cheek strap for my Mangalarga Marchador horse down here in Brazil! I use a split ear for showing ina leverage bit and a browband with throatlatch for any snaffles. I also try to decide what looks best on the horse’s forehead. I like brow bands on broader foreheaded horses, whereas narrow heads tend to look better in a split to skip ear, in my opinion! Love your bridles! We love Weaver leather at my school’s equine program (Middle Tennessee State University) !! I’ve always used both depending on the bit and the horse. I have some horses that prefer a one ear to a browband and of course vise versa. I grew up using brow band headstall, I feel it is more secure. I really love the look of the one ear so I switch back and forth. Mostly I stick with the brow band and throat latch headstalls for their secureness! Great video! I used to use a one ear headstall but I was in a horseshow and when we were lining up at the end of the class my horse started chewing on the bit. The bridle came off over her head and I was sitting there holding the reins and the bridle was on the ground. It was very embarrassing. So now I use a headstall with a browband. I was in a horseshow and was using a one ear headstall and my mare started shaking her head. Her bridle came off and it was so embarrassing. So now I use a headstall with a browband. I had a friend use a one ear with a snaffle and it fell right off! I guess I never really thought about it but it makes sense! I love both styles! I use a one ear on my gelding who has a curb but and on my green broke mare I used a browband with a snaffle. I mainly used each of these because they looked nice on the particular horse. I never really knew why but it makes sense to why whichever headstall. I’m a browband headstall person because my horses are riding in snaffles now. I do like the simpler look of a one ear or double ear headstall on a horse with a pretty head. I always love learning something new! I learned years ago to use browband headstalls with snaffles but assumed it was simply for the added stability it provided, especially for a youngster. I loved your explanation, makes perfect sense! I’m still learning to ride and am on a snaffle so the browband is best. I love the way they look too. Great info! We love how well your horse behaves! We will check our bridles to be sure we have the safest one for it’s use. Great post. I didn’t know, but makes total sense. Thank you. I have always used a browband, but depending on the horse and bit would like to explore the one eared. I use a leather head stall with a browband with conchos on the band. 🙂 Why? It’s just what I like to use. I think it looks nice. Thanks for the explanation. I assumed it was more and English vs. Western choice. I love my Weaver headstalls and I always choose the browband style, my favorite are the ones with dots. I feel that the browband style are better balanced and have less chance of putting pressure on the horse’s ear. I always enjoy Stacy’s tips and actually did not realize that the type of bit made a difference also. Thank you for sharing and for a chance to win a beautiful Weaver Headstall! I ride English so have always used a browband on my bridle with a snaffle bit. I have always thought the one ear was more a fashion statement. I like the look of the one ear and now I know the proper use of both. I’m using a snaffle on a browband headstall. A throatlatch just makes me feel better. No worrying about the headstall coming off easily. Using the saddle because that’s what I grew up learning with. I wish I knew more about different bits. Never thought that th style of headstall had anything to do with bits! So cool. Hello Emaly 🙂 You have been selected as our winner! We would love to get you a single ear or browbrand Stacy Westfall cowgirl spirit headstall shipped. If you could give us your selection choice and shipping address that would be great! Feel free to contact us through here or on our Facebook page via private message. Thank you for entering. Thank you for your illustration of the differenc.e. I ride in a browband with a snaffle—Now I know why!!! Thanks for sharing your knowledge !!!! Genius!! I love the look of a one ear bridle; I’ve been riding with a browband and not liking the aesthetic. But it’s what a girl got to work with I’ve been playing with many bits/sidepulls and other headstalls. I lost my one ear a few years ago when changing barns and I’ve been missing it! I learned that the one ear headstall is better for a leverage but. That is what we use. Thank you for sharing! I never really knew the real difference between the two! Great information! I prefer the browband for training, but like the one ear for show. Wow. Thank for explaining the functionality of both head stalls in regards to bit usage. Makes perfect sense. I use both. One each on two different horses. Would love a one ear as I am about to step my young horse from a snaffle to a bit with leverage. I have used both types of headstallsbit prefer the one ear just for simplicity. Very interesting how they are used with different bits, I didn’t know this. Apparently I have been using the correct bit with the correct bridle accidentally. I use a browband with a snaffle bit when riding. I’m not at a point of being in a show ring or using a leverage bit, but will try one in the coming future. Thanks for the great article as well as video, Stacy and Weaver’s. I have always used a browband because I like that it has a throatlatch. Most one ear headstalls I have come across don’t have them. I didn’t know the bit difference though, very interesting! There is so much to learn about the horse world. Thanks for the great info! Love brow band headstalls for the security, especially when trail riding in heavily wooded areas. I usually love a brownband headstall although sometimes I buy them and the brownband is not long enough for my horses forehead to wear comfortably. I do not have a weaver brand so I would love to try and see if they are made in a way that I love using them! I typically trail ride in a snaffle so it’s browband all the way for me. I now know more of why that’s a better choice for me. My daughter was in her first 4H show yesterday. I can see the need for more tack and bigger variety coming quickly! Growing up, my riding instructor would tell us that people would pull headstalls off horses when racing, so the throat latch was invented 😁 Not sure how true that is, but I still think of it when I ride with my one ear. What of some one ran up and stole my bridle? Thank you for all the great tops and info Stacy! I had both but now ride in a browband and snaffle. I have both types of headstall but for trail and obstacle I use the Browband and it has a leverage bit. It depends on the horse and the bit, but I prefer the look of a one or two ear. I use a browband style on my mare for training purposes, but I love the look of the one ear ! I use a broaband headstall with a troatlatch and snaffle. I’m glad to read and watch this because it’s such small pieces of info that actually have a large impact that others may not even think twice about. Thanks and keep on keepin’ on! Love the details! I have mainly used browbands because the events I ride often need lots of direct contact so I use snaffles. The thing you mentioned about the throat latch stop the bridle from slipping off is a big thing. I was riding a friend’s young horse for them when she spooked. She was wearing a snaffle with a one ear and somehow during her sitting back and spinning around, the bridle went flying. Being on a spooked young horse in an open field without a bridle is not a fun thing. Luckily there were no injuries and my friend updated her tack choices. I’ve been training mostly colts these days so a browband is a must with a snaffle. I still prefer a browband with a leverage bit as I like the look. However, some horses have a small and petite head who look better in a one ear and in that situation I will use a one ear. I would LOVE LOVE a one eared bridle as I have just got my filly competing in a shank bit and would love nothing more than to compliment it with an awesome one eared bridal. Again I learned something new ,Thank you !! Like in the video, I use both types, and the style depends on the bit it is rigged with. I always use a throat latch. I always thought the one-ear looked nice on a mare, like a flower In her hair, and a band, saying “I’m boss” (like a man wearing a nice belt) on a gelding. Lol. That works for me. I use both because I ride western and dressage but I didn’t t know about the why of choosing one over the other. Once I rode in a clinic and I heard a gentleman say ‘I can’t believe how many riders are riding with browbands with shank bits” I happened to be one of them. I asked him what the difference was and he could only say that you always ride a one ear with shanks and a browband with snaffles. So I changed my practice. It’s so great to understand why! Thank you so much!! I use a Brown’s with snaffle for everyday riding & one ear for competition with a shank. Thanks for some great info on the differences. Thanks for the information, interesting ! Browband for ‘work’ and trail riding, one ear for showing. I like the look of the clean throat latch. I ride both. Mostly the browband because we do a lot of trail riding! But I have a one ear with a weaver Argentine snaffle that I use in the arena! For me it really depends on what I am doing. I ride in a browband when I trail ride or when I am schooling a horse. I ride my personal horse in a one ear headstall for shows and arena work. I do use a throatlatch, because she rides best in a shanked snaffle.